Hearing Aids - PPC Landing Page - Fresh Hearing Ltd.
Fresh Hearing are specialist audiologists with multiple clinics across England including Bolton, Warrington, Rossendale and more. Our hearing aids have been designed to be as discreet as possible while enabling you to hear the world around you with complete clarity. We have a wide range of hearing aids and styles available, ensuring that no matter what your hearing problem, we have the perfect solution. Many of our hearing aids are customisable meaning that we can provide a bespoke service tailored to your individual hearing requirements. Our prices are very competitive as we believe everyone should have access to hearing solutions that will help to regain and improve their quality of life. At Fresh Hearing you will find everything you need to know about all types of hearing aid. We offer a trial service called Flex Trail which is a free service allowing you to demo our hearing aids in the real world before you buy. Clinic and Home Appointments Available. Invisible In Canal (IIC) is the smallest type of hearing aid fitting. It sits comfortably deep inside the ear canal and is completely invisible when worn. These hearing aid devices fit completely inside the ear canal. Only the tip of a tiny plastic line shows outside the canal, which is used to insert and remove the instrument. ITC (In The Canal) hearing aids fit all of their components inside a small shell, which is moulded to the shape of the ear to fit inside the opening of the ear canal. In-the-ear hearing aids house their components in a custom made shell that fills the bowl of the ear. Their size makes them easier to handle than some other types of hearing aids. These hearing aids use an in-ear amplifier to direct sound from the shell behind the ear through an acoustic tube and in to the receiver sitting inside the ear. Behind The Ear (BTE) and Over The Ear (OTE) hearing aids contain their components in a casing which fits at the back of the ear, and direct enhanced sound in to the ear. As part of our unique FLEX:TRIAL™ program, we are sending you home with hearing aids to wear in the real world, so you can feel confident that the ones you choose will work well in the listening environments where you spend your time. Step 1 – You’re fitted with the trial hearing aids at your first visit. There is no upfront cost or hidden obligation. Step 2 – You wear the hearing aids home to try out in your day-to-day life – at work, home and play. Step 3 – At the end of the trial period, you decide if you love the benefits of wearing a hearing aid. If not, simply return them and walk away owing nothing. FLEX:TRIAL hearing aids also have built-in features that give us direct insights into your listening lifestyle and your impressions of your hearing aid performance. They automatically keep track of the type of environments where you are spending time, so we can get a true sense of your unique listening lifestyle. Because the better we get to know you, the more personalized your hearing aids will be. 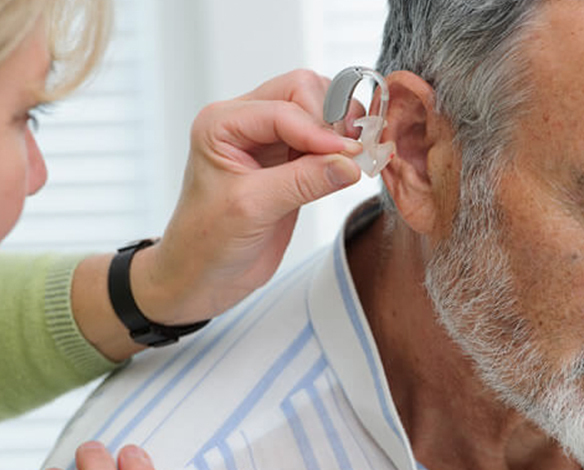 More than 70% of over 70 year olds and 40% of 50 year olds have some sort of hearing loss. You may be experiencing a subtle change or your hearing impairment can be very noticeable. As we get older it is natural for partial hearing loss to occur however hearing impairment can affect people for all ages. If you you are finding it hard to hear or have noticed any change in your hearing quality, no matter how subtle, it is always a good idea to have a hearing test. At Fresh Hearing we can provide a hearing test from one of our professional audiologists to determine if your hearing could be improved by using a bespoke hearing aid.